This beautiful villa with several other apartments is located in a picturesque resort, on a hill in Pjescana Uvala and just 3 km from the Roman city of Pula. This beautiful villa with several other apartments is located in a picturesque resort, on a hill in Pjescana Uvala and just 3 km from the Roman city of Pula. All apartments have tasteful furniture and a balcony. From the balcony, almost all apartments offer panoramic views of the surroundings and the coast. CIP130 extends over the entire first floor and consists of three smaller apartments. 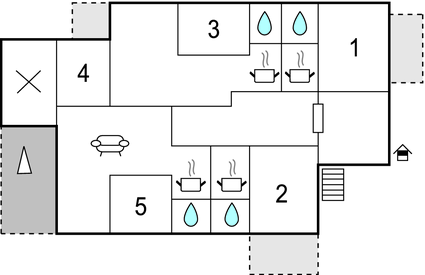 Two of them have two bedrooms, a bathroom, a kitchen and a living room, while the third unit has a bedroom, a kitchen and a bathroom. All the houses have their own terrace. The well-maintained plot includes a beautiful pool in the middle. A barbecue fireplace at the pool is available for all guests. The pebble beach, 200 metres away can be reached by the stairs. Famous restaurants and two slow-food restaurants are at a walking distance. The amphitheatre with various events awaits you near the port in Pula. Visit the resort Verudela, located on the peninsula across the Pjescana Uvala. Here you will surely be spoilt with choices for local cuisines in the restaurants.The peninsula with many sandy and rocky beaches offers many activities for the young and old. There are also some beach bars and even a casino on the peninsula. Pula invites you to street festivals; tourist attractions, shops and cosy cafes await you here. This beautiful modern apartment is made from brick or stone and was recently built in 2003. The agent has rated it as a four star property so it is a well-equipped apartment with above average furnishings. It is also great value for money. This apartment has use of a shared pool and sea view; it is also located in Pješčana Uvala, only 2km from Pula. It is set in a very convenient location, just 200 metres away from a stone and pebble beach. There's also a restaurant only 200 metres away. The apartment has free wireless internet. You can also park on-site at no extra charge. The apartment is well equipped: it has a refrigerator, microwave and shared washing machine. It also has a shared barbecue and some shared garden furniture outside.